The artwork tends to focus on the broad subject of the nature of reality. I have always been intrigued by it, at first it was a scientific curiosity from a physical reality perspective. However my attention drifted towards the understanding of reality from spiritual perspectives – coming from a Sikh background, the essence of the nature of reality was defined by Guru Nanak Dev Ji in the Mool Mantar over 500 years ago. This divine process has been the theme in much of the early artwork and still has a strong influence today. Having experienced a non-physical reality around eight years ago through an out-of-body experience that was triggered by a yogic practice (yoga nidra), I started researching various cultures, traditions and techniques in order to gain some kind of understanding of what I had experienced. This helped me to come to an understanding and a self-realisation of who I may be and how I fit into both, physical and non-physical planes. This of course is an ongoing evolutionary process of self-realisation itself and as it unfolds provides glimpses of an underlying subtle reality, which is masked by our normal everyday waking consciousness. I have since tried to replicate the experience but have never achieved the same result again, most of the time I experience deep relaxation and once in a while I fall asleep whilst in deep relaxation. I made the move from traditional art to the world of digital media in the early 90’s. This was a time when creative computer technologies were still quite primitive by today’s standard however I have not looked back since. I have found that by being in the digital domain my levels of creativity instantly increased, where there are no limitations to artistic expression. This was quite a profound shift which catapulted the imagination and the creative process. I believe it was this shift from a physical to a digital paradigm which was the seed that initiated the start of transpersonal growth, which was then further enhanced by the oobe I experienced. 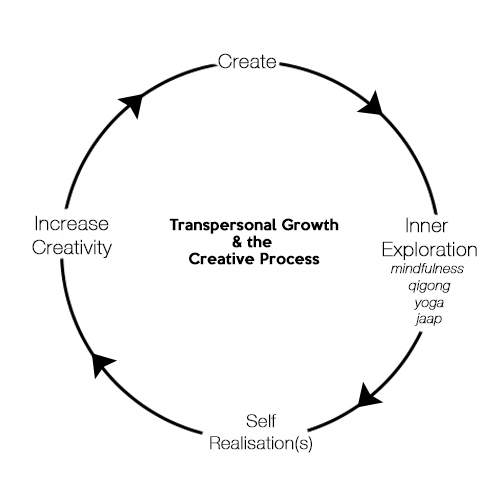 I feel that no matter what I do in life the following cyclic process is constantly running in the background in autopilot and has been for many years, as a result I have to keep creating and refining my awareness within inner exploratory techniques which I have found useful. For example, becoming aware of the subtle energy which exists within and around all living things, (known as chi, prana, ki). The more I practice Qigong the more I become aware of this energy and how intention can then direct it from one part of the body to another and even project it out of the body as well as absorb it from the environment. This was a mind blowing revelation for me and cultivating awareness of this energy by practicing Qigong daily has given me alternative perspective of the nature of reality that we exist in, but do not necessarily sense or know about. I feel that a by product of these realisation’s is that my impulse to create increases and hence the cycle completes another turn the result is another piece of art to come into existence. I usually have multiple projects in progress at any given time and work on each one as and when I feel. There is no real set methodology and I tend to go with the flow of my intuition. I work with and create still images and animations (2D & 3D), using a variety of creative techniques such as digital painting and 3D sculpting as well as traditional 3D modelling and animation. However still like to sometimes slip back into creating traditional artwork as well. This statement, the artwork, this website and myself, are experiencing continual change, like everything in life through, a process of evolution flowing with the universal truth of impermanence. Eventually all will dissolve into the empty void of nothingness, where no sign, memory or physical evidence will remain that any of this ever existed. The only permanent feature of the universe is impermanence itself.